You look up at the tiny deadlight over your head, as you sit on your camp-stool, and you see the water dash over the glass in little waves. You hear the man in the turret give some order to the man at his feet; the floor tips slightly, and you know the descent has begun. You are so inter­ested that nervousness disappears. Someone calls attention to a gage over your shoulder, a glass tube containing a column of mercury, which shows the exact depth to which the boat has dived. You are intent on watch­ing that when suddenly you look at the deadlight again. You see it cov­ered with water of a most vivid green color, and then your eyes go back to the gage. In a moment you begin to watch the crew and to listen attentively to the orders that are given. The man under the turret turns a wheel; the bow of the boat lifts a little, and the gage shows that you are coming to the surface again. The green covering slips away from the deadlight, and finally disap­pears, and you know that you are running along the surface again. A bell sounds with some order from the turret. You look up, and find the deadlight covered again. The boat is going down without dipping. The gage shows that, but there is no sinking sensation. The reserve buoyancy is being overcome by filling the tanks. Another bell is rung, and you know you are under way once more. The gage tells you that the flags on the standards are fluttering along the surface, and the steady rumble and chuggedy-chug throb of the electric motor tells you that you are moving steadily. There is nothing to see but a little com­partment filled with machinery, in which a few men half creep about and turn this or that wheel or push this or that lever, with entire complacency and no evidence of hurry or alarm. Conversation in low tones is going on whenever there is anything of special moment to be talked about. Every move that the boat makes shows that it is under perfect control, and a feeling of entire safety takes possession of you. In a few minutes the sensation of being under water becomes commonplace, and you begin to pity the peo­ple on the tugboat following you and who are perhaps worrying lest some dire thing will happen to you. Except for the cramped quarters, the sensation is practi­cally the same as being in the en­gine-room of a liner at sea, fifteen or twenty feet below the surface of the water. Three dives and a run under water of nearly three miles constituted the performance of the boat on the day we went down. After a little more than twen­ty minutes, we were on the surface again. The turret was unclamped, the air rushed down into the compartment, and the heavy feeling on -the ear-drums for an instant showed that we had been breath­ing an atmos­phere with a pressure slightly different from that on the surface of the water. 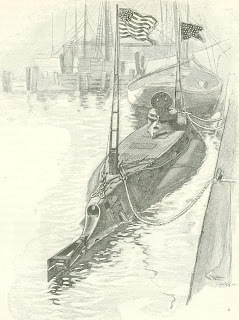 The "Holland," often called the "Monster War Fish," "Uncle Sam's Devil of the Deep," and the like, is, strictly speaking, a torpedo; but a torpedo controlled in all its workings by human agency inside the craft, instead of being automatic in its operations. The or­dinary torpedo, by an arrangement of springs to counteract the water pressure, is made to go through the water at any depth set for it. It has to go in a path fixed for it beforehand. When it has run its course, it comes to the surface or sinks, in accordance with a predetermined plan. The "Holland" has men inside it to control it at will, from moment to moment, and with the additional power to discharge automatic water torpedoes, and to hurl aerial torpedoes as well. The "Holland" is, in round numbers, fifty- three feet long, and in its widest part it is ten and one-quarter feet in diameter. It has a displace­ment of seventy-four tons, and what is called a reserve buoyancy of two-tenths of a ton. The frames of the boat are exact circles of steel. They are set a little more than a foot apart. They diminish gradually in diam­eter from the cen­ter of the boat to the bow and stern. On the top of the boat a flat super­structure is built, to afford a walk­ing-platform, and under this are spaces for exhaust pipes and for the external outfit for the boat, such as ropes and a small anchor. The steel plates which cover the frames are from one-half to three - eighths of an inch in thick­ness. From what may be called the center of the boat a turret extends upward through the superstructure about eighteen inches. It is about two feet in diameter, and is the only means of entrance to the boat. It is the place from which the boat is operated. At the stern is an ordinary three-bladed propeller and an ordinary rud­der, and in addition there are two horizontal rudders -"diving-rudders," they are called - which look like the feet of a duck spread out behind as it swims along the water. The boat is propelled on the surface of the water by a gasoline engine and beneath the surface by electricity from storage bat­teries. From the bow two-thirds of the way to the stern there is a flooring beneath which are the storage batteries, the tank for the gasoline, and the tanks which are filled with water to submerge the boat. In the last third of the boat the flooring drops away, and the space is occupied by the propelling machinery. Another Holland boat, called the "Plunger," is, at this writing, near com­pletion under Government contract at Balti­more, which will be propelled by steam on the surface and by electricity beneath the water. It has twin-screw propellers, and what are known as down-haul screws, to hold the boat at rest under water. It must carry a large steam boiler and three sets of engines, and must have a smoke-pipe; and it is further com­plicated by special requirements insisted upon by the Navy Department. It can discharge Whitehead torpedoes only. The "Holland" needs no boiler, has no smoke-stack or down-haul screws, and can discharge aerial as well as water torpedoes. The only raw material required for its operation is gasoline. With that it may run its engine to charge its stor­age batteries or compress the air in its tanks. There are about a dozen openings in the boat, the chief being three Kingston valves, by means of which the submerging-tanks are filled or emptied. Others admit water to pressure-gages which regulate or show the depth of the vessel under water. There are twelve deadlights in the top and sides of the craft. To remain under water, the boat must be kept in motion, unless an anchor is used. There is always a reserve buoyancy which tends to make it come to the sur­face. It can be steered to the surface by the diving-rudders, or sent flying to the top through emptying the storage tanks. If it strikes bottom, or gets stuck in the mud, it can blow itself loose by means of its com­pressed air. It cannot be sunk unless pierced above the flooring. It has a speed capacity of from eight to ten knots, either on the sur­face or under water. It can go 1,500 miles on the surface without renewing its supply of gasoline. It can go fully forty knots under water without coming to the surface, and there is enough compressed air in the tanks to supply a crew with fresh air for thirty hours, if the air is not used for any other purpose, such as emptying the submerging-tanks. It can dive to a depth of twenty feet in eight seconds. The interior is simply packed with ma­chinery. As one climbs down the turret, he is confronted with it at once. There is a diminutive compass, which must be avoided carefully by the feet. 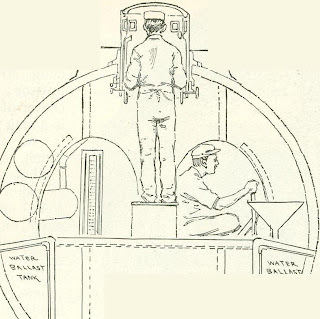 A pressure-gage is directly in front of the operator's eye as he stank in position. There are speaking-tubes to various parts of the boat, and a signal bell to the engine-room. 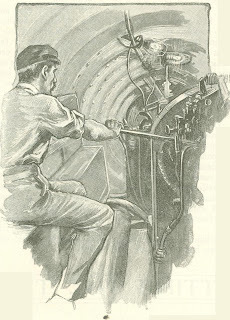 As the operator's hands hang by his sides, he touches a wheel on the port side, by turning which he steers the little vessel, and one on the starboard side, by turning which he controls the diving machin­ery. After the turret is clamped down, the operator can look out through little plate-glass windows, about an inch wide and three inches long, which encircle the turret. So long as the boat is running on the surface, these are valuable, giving a complete view of the surroundings, if the water is smooth. After the boat goes beneath the surface, these windows are useless: it is impossible to see through the water. Steering must be done by a compass, until recently considered an impossible task in a submarine boat. A tiny electric light in the turret shows the operator the direction in which he is going, and reveals the markings on the depth-gages. If the boat should pass under an object, such as a ship, a perceptible shadow would be noticed through the dead-lights, but that is all. The ability to see fishes, swim­ming about in the water is a pleasant fiction. The only clear space in the body of the boat is di­rectly in front of the bench on which the man in the tur­ret is standing. It is where the eighteen-inch torpedo tube and the eight and five-eighths inch aerial gun are loaded. There must be space here in which to load the guns. One torpedo may be carried in the tube, and there is room for two more in the open space at the breech. The breech of the aerial gun is directly above that of the torpedo tube. There is room in the bow cubby­holes for half a dozen projectiles for this gun. Each of these projectiles weighs 222 pounds, and carries 100 pounds of guncotton. The gun can shoot these projectiles one mile. The White­head torpedoes used are of the largest size, and have a running capacity of more than half a mile, at a speed of thirty knots, after they are discharged. Along the sides of this open space are six com­pressed-air tanks, con­taining thirty cubic feet of air, at a pressure of 2,000 pounds to the square inch. Nearby is a smaller tank, contain­ing three cubic feet of air at a fifty-pounds pressure. A still smaller tank contains two cubic feet of air, at a ten-pounds pres­sure. These smaller tanks supply the compressed air which, with the smokeless powder, is used in discharg­ing the projectiles from the boat. Directly back of the turret is where one finds the ma­chinery packed away closely. Up against the roof on the port side is the little engine by which the vessel is steered: it is oper­ated by compressed air. Fastened to the roof on the starboard side is the diving-engine, with disks that look as large as dinner plates stood on edge at each end. 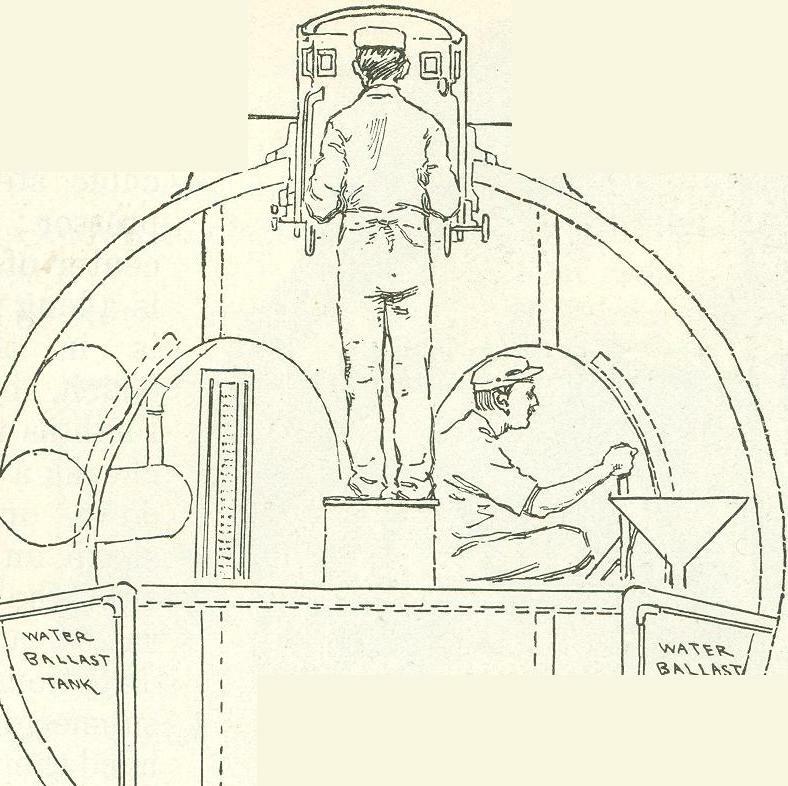 These disks are diaphragms on which the water pressure exerts an influence, counter­acting certain springs which are set to keep the diving-rudders at a given pitch, and thus insuring an im­mersion of an exact depth dur­ing a run. 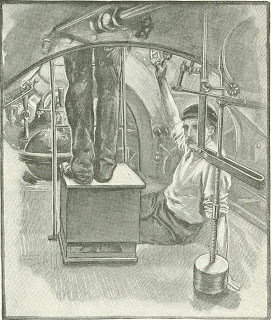 At one side is a cubic steel box - the air-com­pressor; and directly in the center of this part of the boat is a long pendulum, just as there is in the ordinary torpedo, which, by swinging back and forth as the boat dives or rises, checks a tendency to go too far down or to come up at too sharp an angle. On the floor are the levers which, when raised and moved in certain directions, fill or empty the submerging-tanks. On every hand there are valves and wheels and pipes in such apparent con­fusion as to turn a layman's head. Further back in the boat, where the flooring above the tanks ends, is the engine-room. It resembles in its perspective the tunnel shaft of an ocean liner. At one side there are the switchboards for the three dynamotors on board: one of forty-five horse­power to drive the boat; another of ten horsepower to compress air; and a third of one and one-half horse-power to supply the lights and assist in the ventilation. Near the switchboards are the spiral resistance coils, which curve along the roof. Over to one side is the trolley con­troller, which is used in speeding the vessel when under water. The en­gineer turns a switch around just as motorman does when he starts a street car. 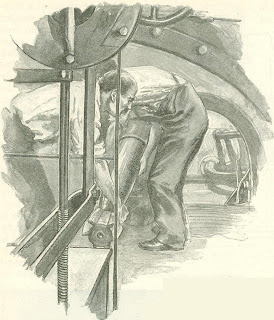 Nearby is the gasoline engine, in the center of the compart­ment; and back from this apparently tangled mass stretches the shaft, which passes out into the water through a stuffing-box. There are also pumps in the boat, a ventilating apparatus, and a sounding contrivance, by means of which the channel is picked out when run­ning under water. This sounding contrivance consists of a heavy weight attached to a piano wire passing from a reel out through a stuffing-box in the bottom of the boat. There are also valves which release fresh air to the crew, although in ordinary runs of from one-half to one hour this is not necessary; the fresh air received from the various exhausts in the boat being sufficient to supply all necessities in that length of time. The storage batteries in the bottom of the boat consist of sixty cells, with a power of 160 volts, and with a capacity for what is known to electricians as 1,600 ampere hours. It is easy to build up stories, products of the imagination, as to what such a boat as the "Hol­land" would do in action; but noth­ing definite and sure can be said until an actual test comes. There is, however, one un­doubted service that a boat like the "Holland" could be made to render in war, and that is, preventing an ef­fective blockade of a harbor. The mere presence of such a boat de­fending a port would keep block­ading ships moving at almost full speed, in order to be safe against its stealing near them while it was submerged and blowing them to pieces; and this movement would carry them probably so far off shore as to permit blockade runners to get in and out easily. Again, such a boat, if in proper working order, could enter a harbor despite floating mines, and could ruin a fleet penned in as Cervera's fleet was. It could travel below contact mines, and there would be no use in attempting to destroy it by exploding mines planted in the mud, because the operators of the mines, in their lookouts on shore, could not see the craft and would not know when to set off such mines. In other words, the chief value of the "Holland," as a develop­ment in warfare, will be to prevent block­ades, and to increase that tension among officers and crews on an enemy's warship, or fleet of warships, that leads in time to com­plete demoralization. In an actual fight between a battleship and a Holland boat, the operation of the latter would be comparatively simple. The "Holland" would have a Whitehead torpedo in its bow tube ready for service, and also a projectile in its aerial gun ready to be fired. The boat would sink so that only its turret would remain above water, and so get within about a mile of its antagonist. So small an object as the turret could not be made out at that distance; and even if it were made out, the result would probably be a panic on the larger boat. Dip­ping beneath the water, the "Hol­land" would prob­ably approach within a quarter of a mile, and then come up for an­other look of a second or two. If it was in the night, it might approach nearer, and when within 200 yards, could discharge its Whitehead torpedo with a fair cer­tainty of hitting the target, espe­cially if the boat had not yet been seen. If the "Holland's" presence had been detected, the big battle­ship would simply run away at full speed. No other course would be open to it. 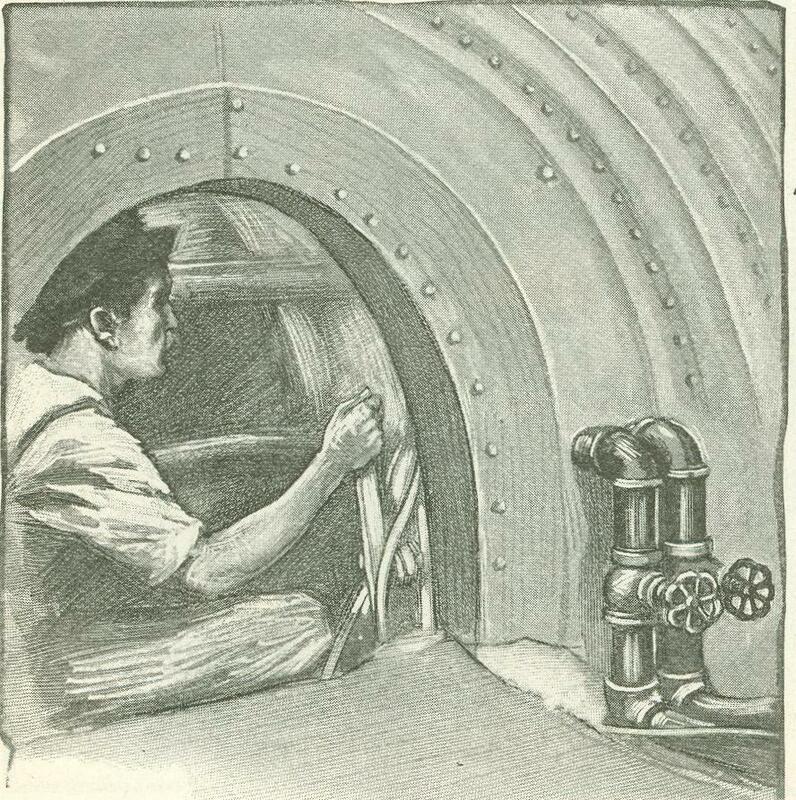 With one torpedo fired from the "Hol­land," the crew would simply place another in the discharging-tube. The operator would slowly raise the boat to the surface, get a line on his target, quickly turn the boat so as to be in a straight line of action, give a sharp com­mand, and then, as the boat was submerged by filling its tanks, another torpedo would be on its deadly errand. If the boat should be seen, and an attempt should be made to run it down, a dive would put it out of harm's way in ten seconds. The chance of destroy­ing it by a torpedo would be very small, be­cause it presents hardly any target; and the same is true of the chance of hitting it with shots from a warship's guns. If the subma­rine boat's presence was suspected, the bat­tleship would have to be kept running at nearly full speed, and at a long distance from port all of the time; if its presence was not suspected, the work of destroying the battleship would not be difficult. In either case, the safety of the port would be assured. Curiously enough, it is probable that the "Holland" would do its most effective work on the surface, hurling its aerial projectiles filled with guncotton the distance of a mile. One of them falling within 100 feet of a warship would probably wreck it. The prob­ability of exact range through the use of pneumatic power has been practically set­tled. The explosion of a large guncotton projectile near a ship, with no means of tell­ing from what exact spot the next one would be hurled, would terrify the ship's crew. The experience of the earthquake thrower, the “Vesuvius," at Santiago shows that. Little actual damage was done by the "Vesuvius," and the same is true of the bom­bardments by our battleships and cruisers; but it was agreed that the shots from the "Vesuvius" worked complete demoraliza­tion among the garrisons near which they landed. Ever since the "Holland" began to attract public attention there has been much talk about "revolutionizing warfare." Such a pos­sibility is always fascinating to the popular mind. Of course, strictly speaking, warfare is never revolutionized. Methods of waging it grow more complicated as science makes new achievements. The successful subma­rine boat adds new problems to these com­plications. This means a development, not a revolution. The assertion that men will not be found willing to engage in the work of operating a boat of this kind has no force when one con­siders the bravery of the men of the South in the Civil War as crew after crew went to certain death in the crude "Davids" in the effort -successful at last - to destroy a Fed­eral warship; when one remembers the eager daring and magnificent courage of Cushing and his companions of those days; when one recalls that recently every man, practically, in Sampson's fleet volunteered to go with Hobson to sink the "Merrimac" in the mouth of Santiago harbor. 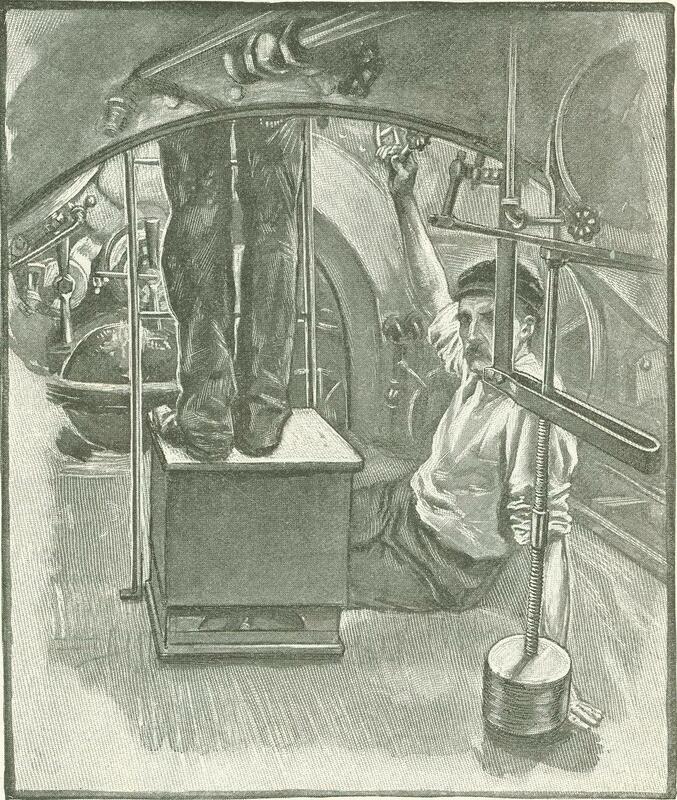 There never will be a lack of men in the United States navy to undertake hazardous work; but with the im­provements that have come in navigation and in warfare, it would seem to be inaccurate to class service in a boat like the "Holland" as more dangerous than any other kind of work in action. Certainly the boat in battle would be safer than the ordinary torpedo boat exposed to fire on the surface of the water. Originally published in McClure’s Magazine in February of 1899.